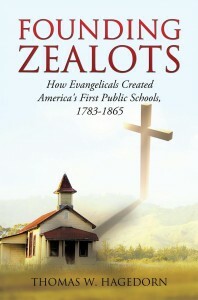 Thomas W. Hagedorn’s new book, Founding Zealots: How Evangelicals Created America’s First Public Schools, 1783-1865, tells, for the first time, how evangelical ministers won the very difficult battle to start America’s public schools and, in the Epilogue, it exposes the disturbing reasons why other historians have told a very different—and inaccurate story. How could Ohio’s first public schools have promoted morality and religion, when today they are either indifferent or hostile to those values? After studying hundreds of old letters, diaries, reports, and biographies he discovered that the teaching of religion and morality was commonplace, not only in Ohio’s first government schools, but all across 19th century America. Surprisingly, he found that most historians have ignored the Christian philosophy, motives, and leaders that laid the foundation of that vital institution. For the first time, Founding Zealots tells the dramatic story of this five-decade-long struggle, the men who fought it, and the reasons why other historians have instead left us with a very different, much more secular account. • Horace Mann’s role as the founder of our public schools is a myth. • Evangelicals–many of them devout ministers and missionaries–started the schools primarily to promote Christian evangelism and discipleship. • Marxist theories underlay some of the accounts of mainstream historians.